I knew Kellie but briefly, but sometime brief moments leave their mark. Kellie was a vivacious tell it how it is type of person. She started teaching at Ruru not long before I did, to be honest I struggled at first with the culture change, time zone change and hubby still in England to name just a few issues facing me, newly landed in New Zealand, not knowing a soul. Kellie was tasked with the job of being my mentor. She was brutally honest, but always with a smile: I had a lot of respect for her intent in standing up for what she believed in, come what may, as well as putting me straight a time or two! I was bowled over with the number of people at her funeral: easily 500-600, standing room only. Her brutally short battle with stomach cancer is one I empathise with, mum fought it for 65 days, Kellie lost her battle at 54 days: she was only 34. I saw the same indescribable pain in the faces of her family as they carried her in, as I felt the day we said goodbye to mum. That pain never goes away. Life seems so unfair at times, who are we to question why thing happen the way they do. The difference with Kellie is she had the courage and strength to record her own goodbye message, which was played at the end of her funeral. I wish mum had been able to do that. I haven’t ever listened to the words of someone recorded when they were alive with the intent of playing them when they are no longer here. It was an incredibly moving message, haunting hearing her voice thanking us for all paying our respects at her funeral, thanking people for their kindness and messages of love to her family. The one thing she did say that I will never forget is this. It’s not a new message, it’s one I have lived by since mum died in 2013: live life for now and never waste a moment, because you don’t know how much time you have left. It’s a simple message that I totally agree with, but hearing from someone who has died, leaving it as a message to us who are still living, there are no words to describe that. Her words will haunt me for a long time. I can appreciate the incredible strength it would have taken to make that recording. 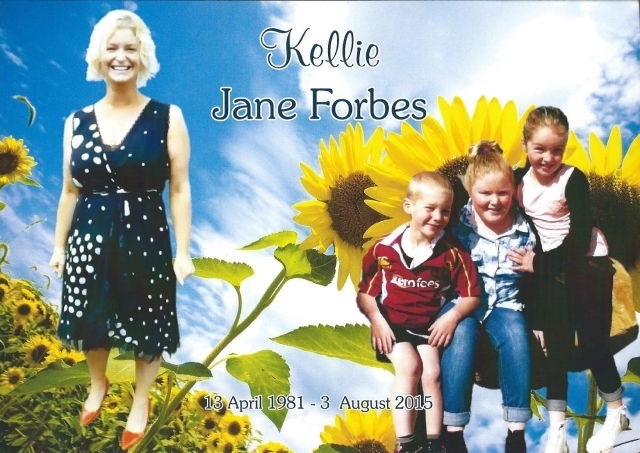 Kellie, you were a vivacious potty mouthed smiler who I won’t ever forget, I hope all those hundreds of people at your funeral take heed in your message. ← Life whizzing by..don’t let it.